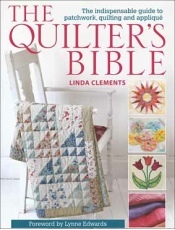 The Quilter's Bible presents essential know-how together with a wide range of inspirational projects, tips and ideas collected from international top-name quilters. Ideal for both the beginners looking for trustworthy advice in a single volume and the committed quilters searching for authoritative reference for seldom used techniques. Over 15 projects featured including cot quilts, bed quilts, lap quilts, bags, cushions, wall hangings, table mats and runners, and other beautiful projects for the home.